This is St Louis' first micro-distillery. If you're curious as to what a micro-distillery is, their informative drink menu will give you all the details about the different types of beer that are available here and elsewhere, how the brewing process works, and how distilling is different than brewing. Obviously, Square One has great beer selections. My personal favorite was the Single Malt Scotch Ale. This ale has a deep, complex flavor and I knew exactly what entree to order with it because they offer a beer pairing selection right on their menu next to all of their entree selections. They also have an extensive drink menu, but be careful because they make them very strong. My recommendation for one to try would be The Square One Sour. But restaurants are all about the food aren't they? Well, Square One doesn't let you down in this regard either. They have a unique and diverse menu with all of the classic pub favorites and everything, in my experience, was cooked to perfection. The buffalo hot wings were mild enough for almost any palette to enjoy, but the flavor of the wings and the Gorgonzola dipping sauce was amazing. The muffaletta was good and I would also certainly recommend the burger of the week, (although, as the name suggests, what you order will most likely be different from what I had that week). Their burgers do seem to come pretty pink in the middle, which I personally enjoy, but if you like a more well-done burger I would suggest mentioning that to your server when ordering. The brewery is located in Lafayette Square, which is a bit of a drive from downtown. There doesn't seem to be much else around to draw a tourist there other than the restaurant. But, if you do make the trip you will find it has a quaint small-town feel and the local shops and the park are worth walking around. I know that the next time I go to St. Louis I will be making a trip back to Square One Brewery and Distillery, and I suggest that you do the same. There are lots of options in downtown St. Louis: from the more upscale locations like the Millennium Hotel, the downtown Hilton, and the Omni Majestic Hotel to the hotel/casinos that run along the Mississippi River and to even more affordable options. The downtown hotels are your best option if they're in your budget because they are within walking distance to Busch Stadium, the Gateway Arch, Edward Jones Dome, the Old Cathedral, Laclede’s Landing, and the Scottrade Center as well as plenty of restaurants, bars, and shops. If the downtown hotels are all booked up or you are looking for something outside the city, there are plenty of other options in the surrounding areas. You can find budget hotels just over the river and the state line in Illinois. While there isn't easy access to the downtown amenities, they are just a short 15 minute drive away. Yes, this option may seem a cliché for St. Louis. But the fact of the matter is that the Gateway Arch is something completely unique and absolutely amazing. No trip to St. Louis is complete without seeing it. Depending on the time of year and the specific days you're in St. Louis it might make sense to avoid going up to the top simply because of how popular it can be during the busiest times. But, if it makes sense for your trip, it really is an incredible experience. The information you can learn in the visitor center is a lot of fun and very educational. The trip up to the top in the tram is one-of-a-kind. And the views of the Mississippi River, downtown St. Louis, and the surrounding areas are beautiful. The casinos offer gambling, restaurants, clubs, and spas. Whatever your favorite activity is when traveling you can usually find it at a casino/resort. Harrahs is probably the best that St. Louis has to offer, but it's not really walkable to downtown, so make sure that you consider that while making your plans. Lumiere Place is right downtown and will have everything that you're looking for during your vacation. On a busy weekend though, traffic could be a pain as it's situated right in the middle of everything. Make sure you research all of the casino options that St. Louis has to offer because they have other great choices as well such as Argosy, Ameristar, and others. 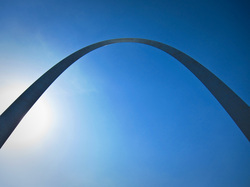 To help plan your trip to St. Louis, visit www.explorestlouis.com.